So 14th April 2013 was the date I became a marathon runner. 26.2 miles completed, wow! Since then I have taken time out to rest and recover but mostly I have spent the time to reflect. It was almost 18 months ago that my amazing, beautiful nephew was diagnosed with the terminal illness, Tay Sachs. We knew from that moment that the clock was ticking and Archie’s time with us would be cruelly short. Yet through this devastating, sad news two people stood up and showed immense courage in the face of tragedy, they were Archie’s parents Brad and Lauren. The fact that these guys were able to get up everyday and open their curtains despite what they were going through was inspirational to me. How could I not get off my arse and try to do something positive to help. So following a suggestion from Archie’s Uncle Matt, in March 2012 I signed up for my first ever race to raise money for The Cure and Action for Tay Sachs (CATS) Foundation. Now I was never what you would call fat but I was definitely overweight, definitely lazy and I was definitely unhealthy and out of shape. Heck – nine out of my top ten most phoned numbers were takeaways (the other one was the wife!). I remember going out for that first run in January last year. It was a Saturday morning, 6.30 am, I’d put on my old trainers, a pair of tracksuit bottoms and a hoody and off I went into the morning darkness. The distance between my house and the train station is a third of a mile. That morning I think I stopped four times for a walk/breather before I even got to the station! Anyway I carried on with my run, stop, walk routine and after 2 miles I was on the floor. 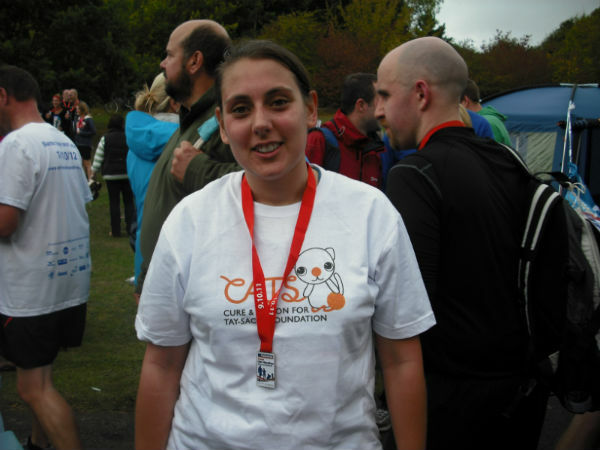 Six months on, I was signing up for my first marathon, The Brighton Marathon 2013. Before I go any further I must stop to thank my loving wife, Lisa, who has been by my side every step of the way. Without her love and support this journey would have been made a hundred times harder. It has been tough for us both, especially in the last couple months of training. Lisa worked night shifts on the weekend and my eldest daughter played football on Sundays so I could only fit my long runs in on Saturday afternoons. This meant most weekends myself and Lisa would maybe spend a couple of hours in each others company. Despite this Lisa’s support and encouragement never waivered, I can’t thank her enough for this. December 24th 2012 had arrived and following some enforced time out following an injury after the Cardiff Half my 16 week marathon training plan had began. Why did week one have to fall the week of Christmas I thought, but it was actually quite fun, running in the morning, eating and a few drinks in the afternoon. The plan was three mid week runs varying between 3 and 7 miles each and one long run on the weekend starting at 10 miles, slowly working up to 20. My midweek runs would normally start between 5.30 and 6 a.m which meant stealth manoeuvres were required to get my kit on and myself out of the house without waking the wife or any of the three kids! My favourite saying during this time was ‘the hardest part is getting out the front door’. As you all know the winter was pretty darn cold and to pull myself out of my warm bed to go running in the freezing conditions was pretty difficult. But every time my mind was winning the battle convincing me to stay in bed the thought of Archie snapped me out of it and got me out themdoor. With the exception of the cold, the dark, the windy viaduct, the spooky cycle path, the council cost cutting non existent street lights I quite enjoyed it. With the sound of the odd car or two I found these runs to be very peaceful, it was a good opportunity to organise my thoughts for the day. My long runs were a roller coaster of ups and downs. A good run would fill me with confidence and gave me a feeling I could take on anything. A bad run would fill me with dread and the pressure would build for days after as time edged closer to marathon day. But above everything else my long runs became my therapy, my time to think and crikey I did a lot of thinking. I would think about Archie, my brother Brad, my three wonderful daughters, the CATS10k challenge, new challenges, new ideas. All sorts would go through my mind and a lot of emotions and feelings were sorted out during these runs. With just over six weeks left until the marathon we had the news that Archie had fallen ill again with another infection and it had been decided that he would be moved from hospital care to hospice care. He was transferred to the care of the amazing people at Ty Hafen and Brad explained that it was now all about comfort and pain relief. It was a terribly difficult time and it broke my heart to see the pain both Brad and Lauren were going through. On 25th March Archie passed away whilst in the arms of the two people that loved him the most. A day of sadness but also the day we knew Archie would finally be free of Tay Sachs. We arrived in Brighton the day before the big day. The last few weeks had been very strange and were a whirlwind of different emotions. But I was here and with less than 24 hours to go before I attempted to complete the 26.2 miles! I had always thought of running as quite a lonely thing to do. Thanks to an old friend, Lee Maxwell, I quickly realised that I was so wrong in this thinking. Lee had introduced me to an online running community called BOSH Run a year earlier, these guys are a truly wonderful group of people. During the Brighton Marathon I thanked Lee a million times in my head as the support I received that day was amazing and was one of the factors that got me to the finish line. Race Day – The Build Up – We caught the train shortly before 7 from Burgess Hill to Preston Park. On arrival I clocked the portaloos and headed straight for them. After a quick empty of the bladder I then went back two minutes later for another wee. After wee number three I headed to the clock tower to meet the Bosh Run team. So many of these guys have given their time to help and support CATS and Archie over the last year, I felt very nervous about meeting them all for the first time. To see the likes of Fiona Robson and Trefor Harris in their CATS Running vests brought a lump to my throat. With the exception of Lee Maxwell these guys from Bosh were strangers last year yet here they were with so many wearing either CATS vests, In Memory of Archie Arm Bands, Team Amazing Archie & CATS wrist bands, simply amazing. After a lot of handshakes, photos, back slapping & confidence boosting words I headed down to the pink starting pen to meet my good friend Phil Jones (also running for CATS) and Dennis Cartwright (a true gentleman and all round top guy). More confidence boosting motivational words were exchanged along with more handshakes and back slapping, I slipped a lucozade gel down the hatch and it was time to go! Bit of a strange start, being so far back (or maybe it was lost in the nervous excitement) I have no memory of the starting gun going off. It was a couple of minutes later when the Kenyans flew past to our right hand side, wow we hadn’t even left the starting pen and they were passing the 1 mile marker! Crazy! After a high five with England Wicketkeeper Matt Prior we were off. Myself and Phil agreed a couple minutes before the start that we would keep together for as long as we could, a great decision. We talked when we needed to talk; we kept quiet when no words were required. A high five from Mark Jenkinson (a great guy and I cant wait until you are back running again mate!) after mile 1 provided a nice rush of adrenaline. Really enjoyed miles 5 to 12, an out and back 7 mile route which meant you could see the faster runners coming back on the way out and the slower runners on their way out on your way back. It felt like every couple of minutes I was either being shouted at by another bosher, Go Brian! Go CATS! or I was screaming at boshers as they flew by (Scott, Lee, Stu, Helen etc). At mile 12 we headed along the seafront and towards half way. It was at this point I started looking for Lisa and my daughter’s faces in the crowds. My plan was to give them a smile a thumbs up grab Rupert Rabbit and then tackle the next 13 miles of the race. Sadly an error with the Brighton Marathon Tracking Mobile App meant the girls turned up at the right spot but ten minutes after I had gone through. I didn’t think not seeing my wife and daughter Lauren would affect me so much but just as we passed half way Phil spotted his fiancé and jogged to her for a quick kiss. I don’t think I have ever wanted to see my wife more than I did at that moment. The metres kept ticking along and the further I got from that half way point the more I knew I had missed my chance to see their faces. It was at that point Phil told me he was going to slow his pace down and it was decided we would go our own and run the second half alone. So not only was I dealing with not seeing the wife and not picking up Rupert I had now lost my wingman. It was then time for the long stretch along Church Road. In all my preparations I had not really paid any attention to this part of the curse, sounds stupid but on the map it looked small, easy, and almost insignificant. I was so worried about the Power Station in my mind Church Road was the easy bit. The first problem I hit was at mile 15 when my shoelace came undone. It was my left one and after a quick stop I felt my left knee tighten and become moderately painful. I didn’t worry too much as I have had left knee issues in the past but normally would run through the pain, so off I went. By this time my mental state had deteriorated somewhat and with the heat rising panic was starting to set in. I have felt this way a few times during training runs and my normal technique to get through it would be to focus on a point in the distance and then break it down into mini checkpoints. For example I would calculate in my head that I was say 2 miles from home, break that down into four checkpoints, the pond, the underpath, the viaduct, home. Instead of thinking about home I would only think about the next checkpoint until each had been successfully passed. Church Road was different, it was very flat so I couldn’t see the turning point, I couldn’t remember how many miles the road was and as I couldn’t see the turning point and didn’t know the distance I couldn’t break it down onto smaller chunks. Church Road seemed to go on forever and ever. It broke me more than it ever should have! By this time I was back on the seafront the sun was raising the temperature further and I was heading out to the Power Station nicknamed the Road to Hell! Not only was I dealing with the mental scars of the last few miles but my knee was getting worse, I had self diagnosed the issue was my IT band and concluded that if I was going to finish this it was going to get very painful indeed. Mile 20 and BOSH HQ – sadly spotted too late to slow down and stop (and I didn’t want the guys to see how much pain I was in) so a shout of ‘Go Bosh’ a thumbs up and a forced smile from me was all they were getting. Later found out they were giving away free hugs, and in hindsight I bloody well needed one! The Road to Hell was just that, from the stupid number of speed bumps, the stench from the fish processing plant and the smaller numbers of support, it certainly lived up to its name. It was at this point my thoughts were firmly fixed on Archie. A memory of his amazing smile before the symptoms of Tay Sachs began made me smile, but memories of his fight with the disease brought me to tears. By this time I had put together a run/walk/hobble routine to manage the pain in my knee but after each repeat the pain got worse and worse. So my knee was gone, my mind was gone and my emotions were shot to pieces, maybe it was time to quit? I think I was almost at mile 24, my head was down, my hands were on my hips, I was walking and one of the official photographers was taking pictures of my demise. I was basically on my arse. But just as I was about to give in an arm wrapped round my shoulders and the words ‘cmon Brian, head up, you know why you need to do this, lets finish the job!’ were spoken to my ear. It was Sunday Odesanya, a member of Bosh Run whom I met the previous day at the expo. He dragged my arse off the floor and away we went. A true testimony to what Bosh is all about, thanks buddy. We had 1km to go so Sunday flew off chasing his desired finish time and with a new found confidence I continued towards the finish. 800 metres to go and I spotted my wife, my daughters Lauren and Summer, my brother /Archie’s dad, Brad and my sister in law / Archie’s mum, Lauren. All I could think, where is Rupert. I started shouting ‘wheres Rupert, give me Rupert!’ bags went flying from the baby’s pushchair and Rupert was finally in my hands. Archie had a favourite cuddly toy, he was a Rabbit named Ruben. It was agreed that Ruben would stay with Archie and go wherever Archie went when he left. But Ruben had a brother, Rupert and Rupert would do all the things in life that both Archie and Ruben couldn’t. On the 14th April 2013 Rupert crossed the finish line at the Brighton Marathon. I remember as I ran past the main spectator stands lifting Rupert above my head as a tear rolled down my cheek. A shout and a cheer from Dan @ CATS and another from fellow Bosher Stu Robson and I was finally over the line. Not the quickest time ever but it was done, my first marathon complete. Thanks – I have had some amazing support over the last year by some amazing people and I thank every one of you from the bottom of my heart. However before I finish special mention must go to the following people. Whether it was support, advice, raising awareness of Archie and Tay Sachs or just putting up with me (excluding the wife as she has been thanked already!) these guys were amazing; Fiona Robson, Dan Lewi, Lee Maxwell, Stu Robson, Jacqui Byrne, Keith Elshaw, Darren Hatch, Dennis Cartwright, Phillip Jones, Trefor Harris, Brad & Lauren Watson, Annie Kitchin & Mark Jenkinson. I could spend the next few hours writing down names so again thank you to everyone who has helped and supported such an cause over the last year or so, and thanks for reading my marathon story. Love and peace to all – a few photos from the day can be seen below. running has certainly become part of the joys of life for him. Many good wishes to you and all the Watson family.